Organizing with the Love Today Project Planner!!! The Love Today Project Planner Kit is so beautiful and perfect for anyone who likes to plan and organize their days/weeks/months/year!!! The Navy, Gold, and Roses are just stunning! Check it out!!! Here is the album with the 3 stacks of Post-It’s that match! The front cover is very hard and sturdy with gold corners! 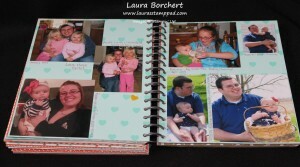 The inside has each of the months with daily/weekly inserts to plan everyone out perfectly! Here you can see there is a plastic divider that can be placed in the current week so you can flip to it quickly! 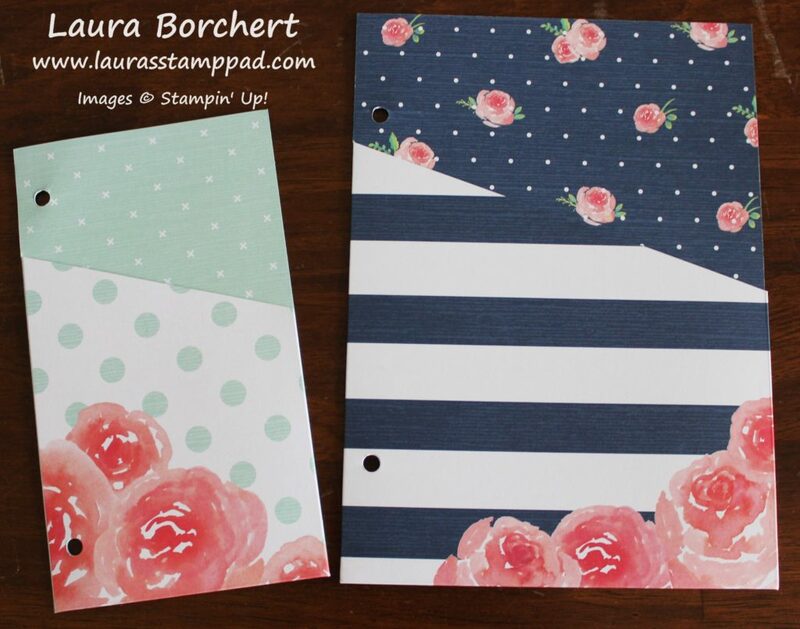 These 2 pocket pages are perfect for dropping in notes, receipts, photos, or other fun things! Since the planner is a ring binder, these can be moved to any location in the book! Here are all of the pages for each month! The first page has the tab with the month on it. This page is rather thick and glossy and has a fabulous pattern on each one. Each month is different! I love them all! The next page has little boxes with grids, lines, and more for you to jot down notes, drawings, ideas, or goals for the month! Next is the full month calendar. These calendars don’t have the numbers on there so they can be used for any year. You could start in August and go through to next year! I love that! After the full 2 page calendar, there is a double page spread for each of the weeks in the month! This has a spot for each day including the weekend to put appointments, meal planning, and any other notes!! The final page of the month is the lined page. This is perfect for notes on how the month went or extra spot for a to-do list or goals! Here is a photo of the cover! I promise it is Navy even though that photo makes it look brighter blue. Also, there are decorations for the planner! 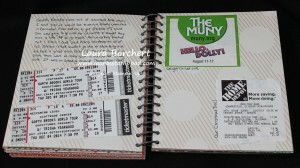 There are 4 of these pocket pages that can be used for decoration, ticket stubs, photos or anything you wish! There are also lots of sheets of stickers including those amazing gold foil ones. I love it!!! Memory keeping is super important because you can look back and everything is documented. It can be passed down for years as well! The pocket style is quick and simple! 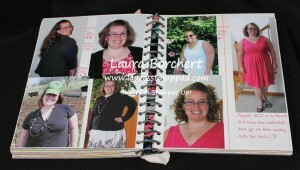 I have done all types of scrapbooking from small books to big books, digital and now pocket style. Here are my tips and ideas on the pocket style! With all of the memory keeping I have done, I have loved how little supplies you need to create an amazing album! Of course you can always get all the goodies and have lots of options. Although that sometimes makes it overwhelming to have too many options! 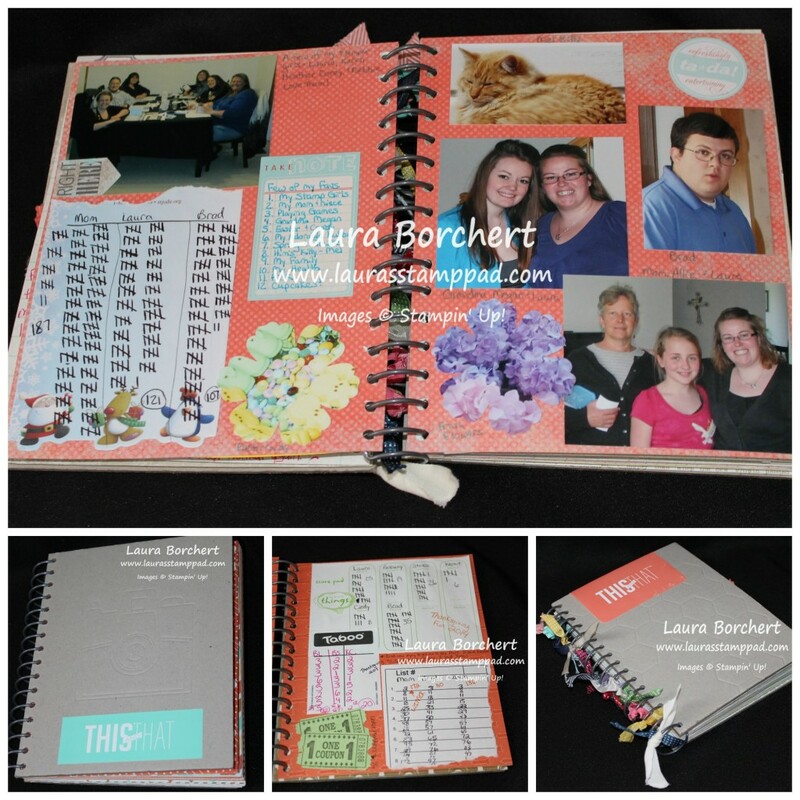 Just to get started, all you need is an Album, Pages, Journal Pens, and a Card Collection Kit of your choice! My favorites are always the all occasion/every day ones! I love bright colors too! 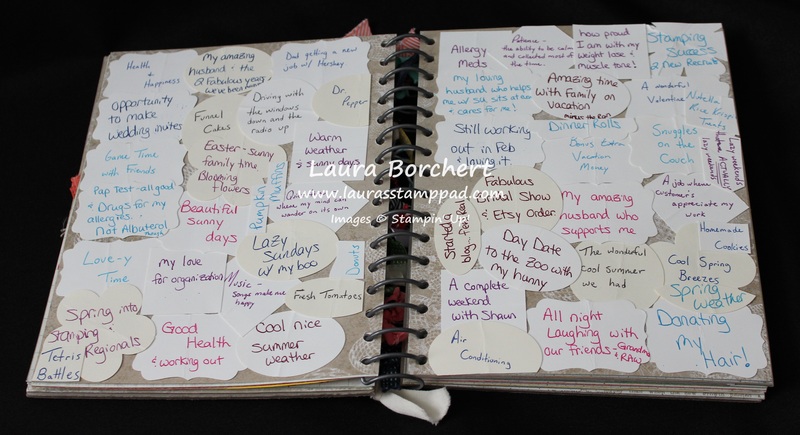 I honestly think that Project Life or Pocket Style Memory Keeping is the best way to go for someone who has never scrapbooked before. Project Life is cheaper, easier, and quicker. Now of course that can always be viewed differently by each person but being a scrapbooker, a digital scrapbooker, and a Project Life scrapbooker, that is what I would say. Cheaper: Of course, you can always purchase tons of goodies but technically you could go as simple as the items above. You can always get a paper trimmer, adhesive, and go all out but you can also go simple too. Easier: With Project Life, you can drop your photos in the pockets, journal on a card, and drop it in. I love that and how everything in the card collection coordinates. There is no need to pick your colors, papers, embellishments, and find ways to fill a large album page. Quicker: It can be fairly quick to complete an entire album because of the few items you need and the ease of coordination. Of course, you can always embellish, change up the colors, add layers, and go all out with Project Life as well! 🙂 It really is a fun way to keep your memories cherished forever. 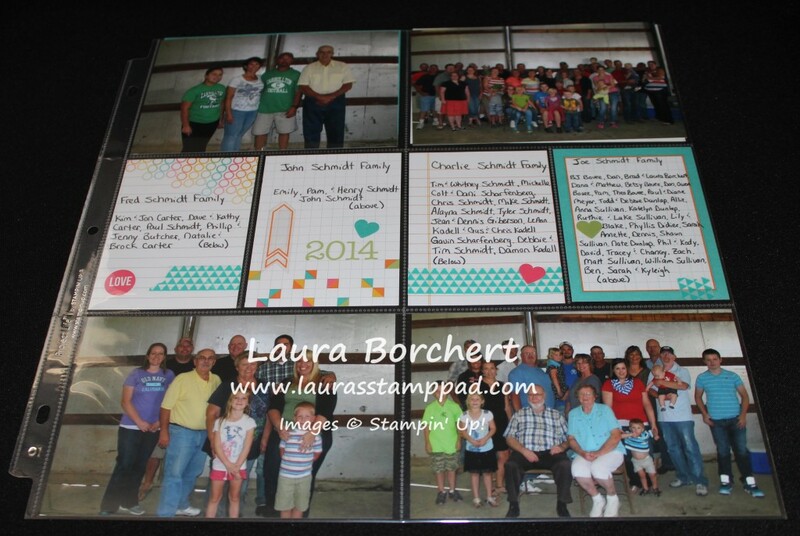 I hope this has given you some ideas and inspiration to start preserving your memories!!! You can see some of my other albums here, here, and here! The Memories In The Making Project Life Card Collection is one of the items that you can earn for FREE through Sale-A-Bration!!! I thought the cards were super fabulous because many of them are window sheets with frames and borders and amazing designs. There are a few that are gold on one side and silver on the other. WOOT WOOT! I love how there is something for everyone there. The other pieces have embossed prints on them so you can have fun and add color for an emboss resist technique. Love it!!! I didn’t want to waste that little strip that I cut off so I created this card. I took another Memories In The Making Card, stamped the greeting from the Tin Of Cards Stamp Set in Stazon Ink and added it to my card front once it dried. Be very careful when stamping on Window Sheet as it can be slick and want to slide all over. Straight up and down! This is one of those cards that the dotted wreath is gold on the back side. I’m a silver girl though! 🙂 Since you can see adhesive on Window Sheet, I just added it to the left hand side where the patterned paper is. It is held securely with Tear & Tape so I don’t have to worry about it coming off! 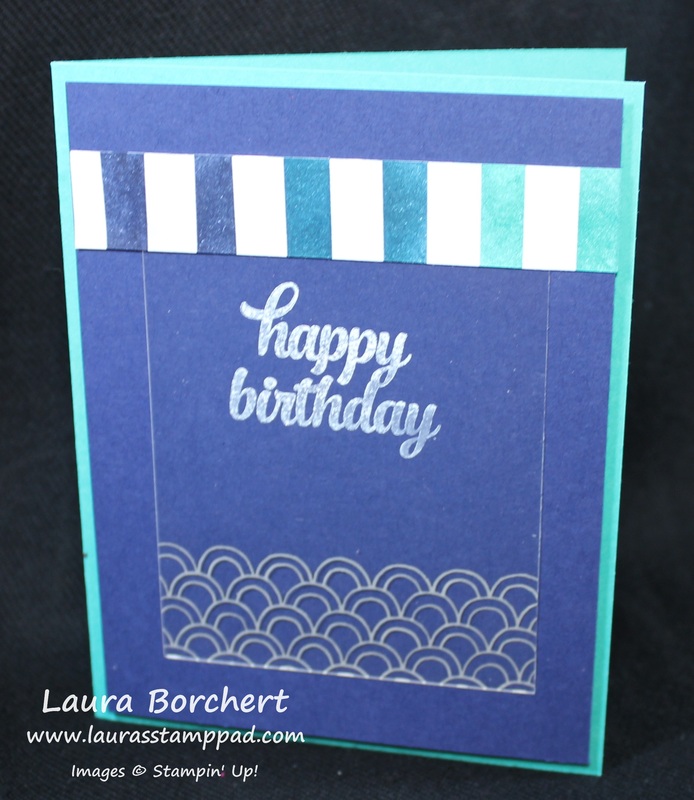 I wanted to do another one so I took another Card from the Collection that was embossed stripes. I used my Sponge Daubers to add color in this amazing ombre pattern. I used Bermuda Bay, Island Indigo, and Night of Navy. I loved how it turned out. I wrapped some Silver Metallic Thread around a few (hundred) times on the left hand side and tied a knot. I added it to a Bermuda Bay card base and did the awesome greeting again from the Big News Stamp Set. Perfect Man Card!!! Then with the little strip that I had to cut off, I created this card. Again I took one of the Window Sheet Cards and stamped in Craft White Ink with the Tin of Cards Stamp Set. I adhered it on with Tear & Tape under the strip of ombre! I love how these turned out! 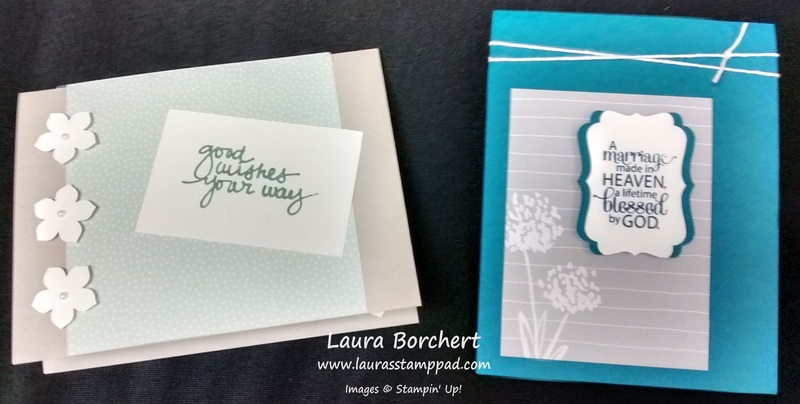 You can use Project Life Card Collections for greeting cards and memory keeping. They are so much fun and so versatile. 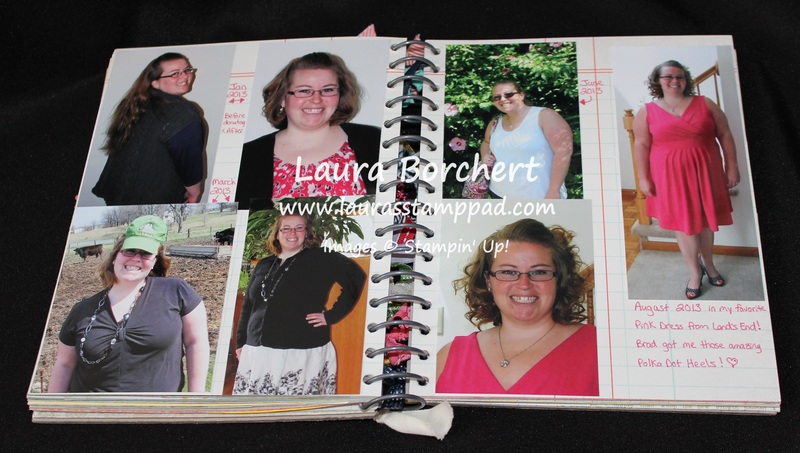 You can check out a few of my Project Life Album Pages here! To see all of the cards from the Memories in the Making Card Collection, check out the Video Tutorial below or click here! 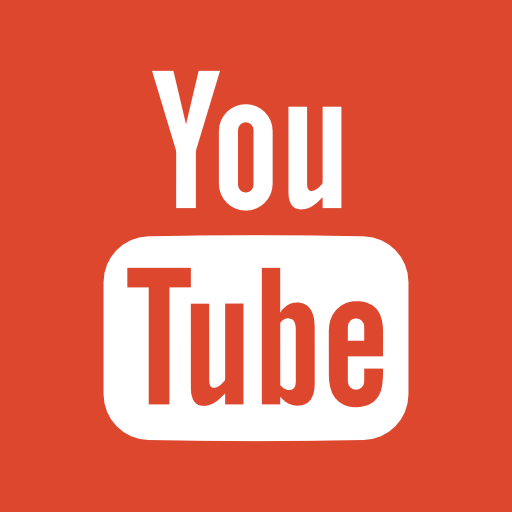 Don’t forget to give it a thumbs up if you liked it. 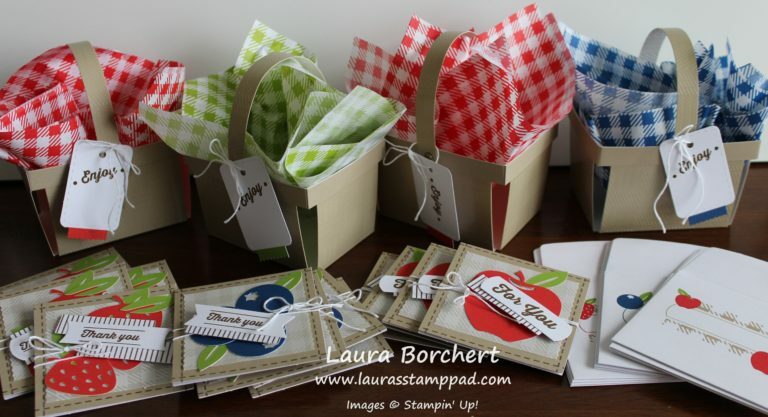 Have you ever tried the Project Life Card Collection for memory keeping or card making? Let me know in the comments below! 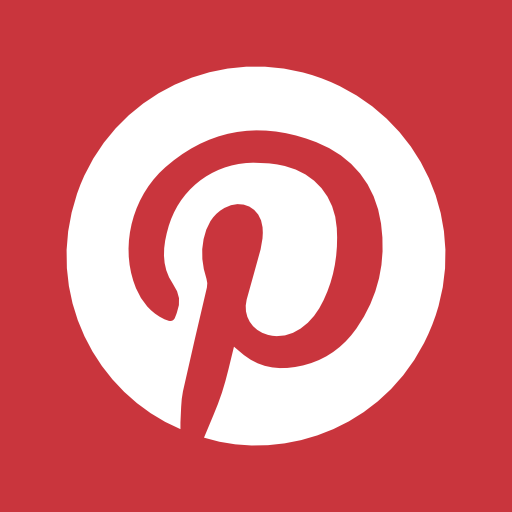 Cards & Home Decor with Project Life!!! On Monday, I shared with you a few of the pages that I have created with Project Life!!! You can check that out here! 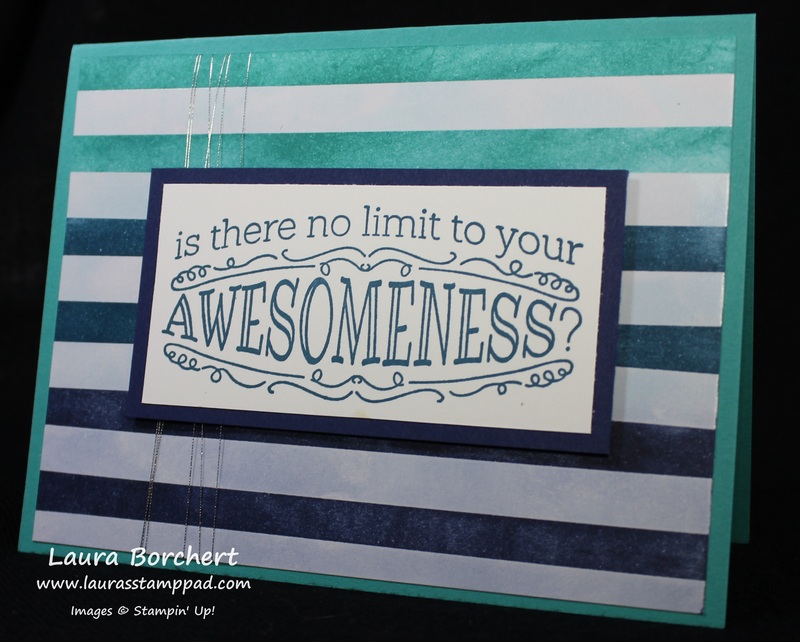 Today, I’m going to share with you a few other ways to use your Project Life Card Collections!!! How adorable and simple are these cards?? These were all made with the Moments Like These Card Collection! 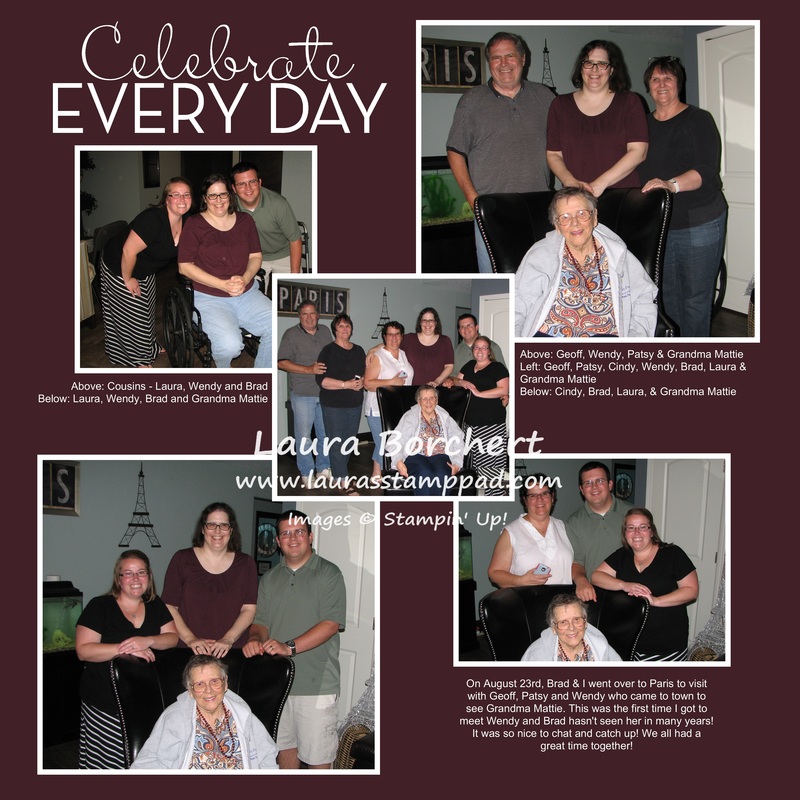 I added some greetings from the Remembering Your Birthday, Lovely Amazing You Stamp Set, Blessed By God Stamp Set, and Friendly Wishes Stamp Set. I added some Rhinestones, Linen Thread, and punched flowers and I was all set! Here are a few others using cards from a few other Card Collections. 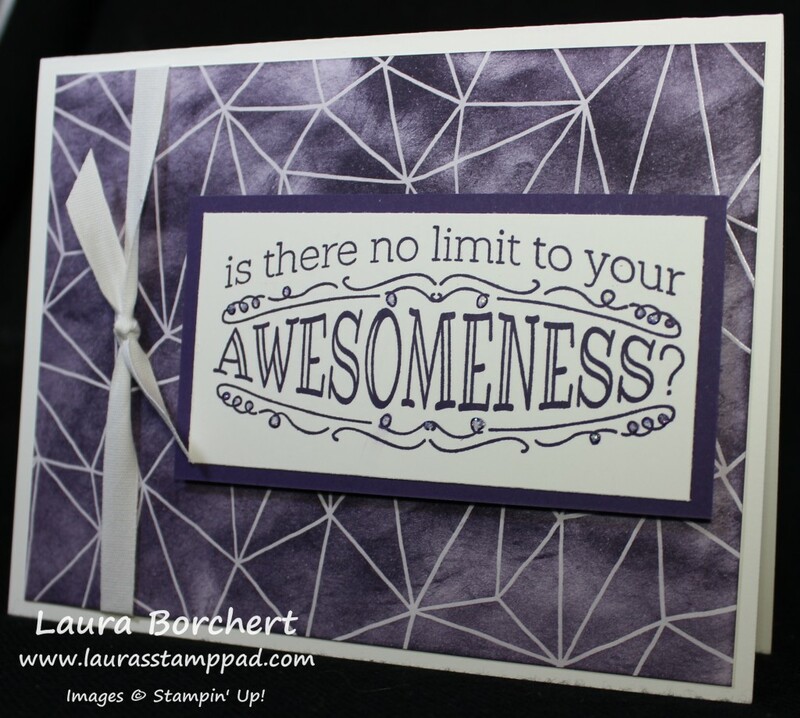 The Hi card was simply made by adding the Card Collection to a card base with Stampin’ Dimensionals! It can’t get much simpler than that!!! 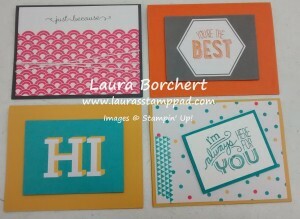 Here are a few more cards that were created at the Project Life Class that I had. I love how creative everyone got! So simple and yet so fabulous!!! Here is another set of cards that were created with the Moments Like These Card Collection and the Love Story Card Collection! 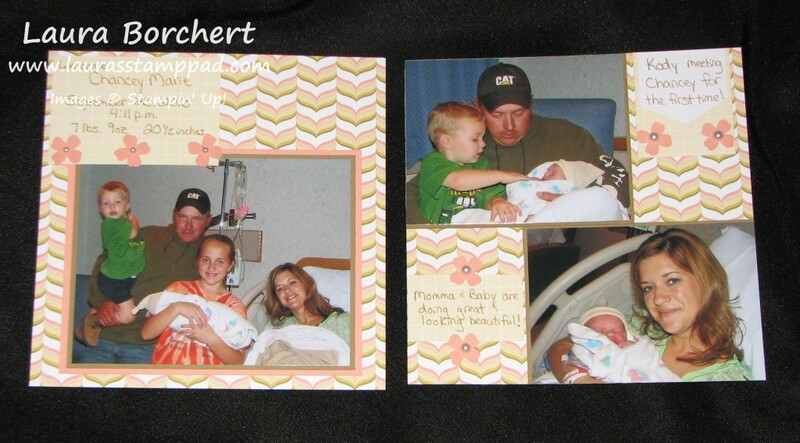 The card on the right was created by one of the stampers in my class as a wedding card and then this is the gift! 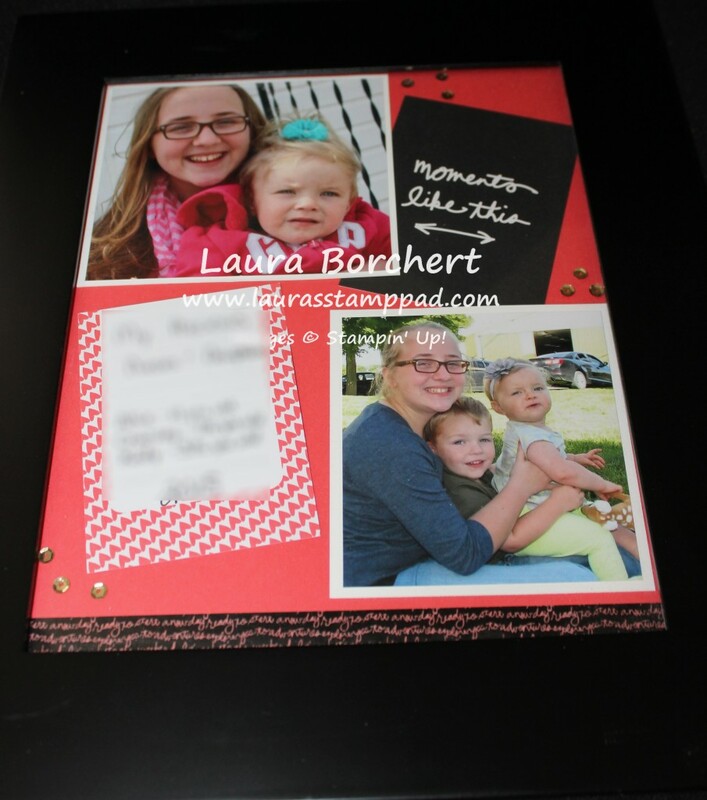 This is an 8″ x 10″ piece that will go in a frame with pictures in the black squares! How fabulous is that?? I love it!!! Here is an 8″ x 10″ framed piece that I created! I used the Moments Life These Card Collection and then added the Washi Tape and Sequins from the Accessory Pack! Love it! I did the writing with the Project Life Journal Pens! Love those things! There are so many wonderful things you can create with the Project Life Card Collections!!! Have you tried Project Life yet? Let me know what you think in the comments below! Memory Keeping with Project Life!!! Have you heard about Project Life??? It is a wonderful line of memory keeping products that make it fun and simple. 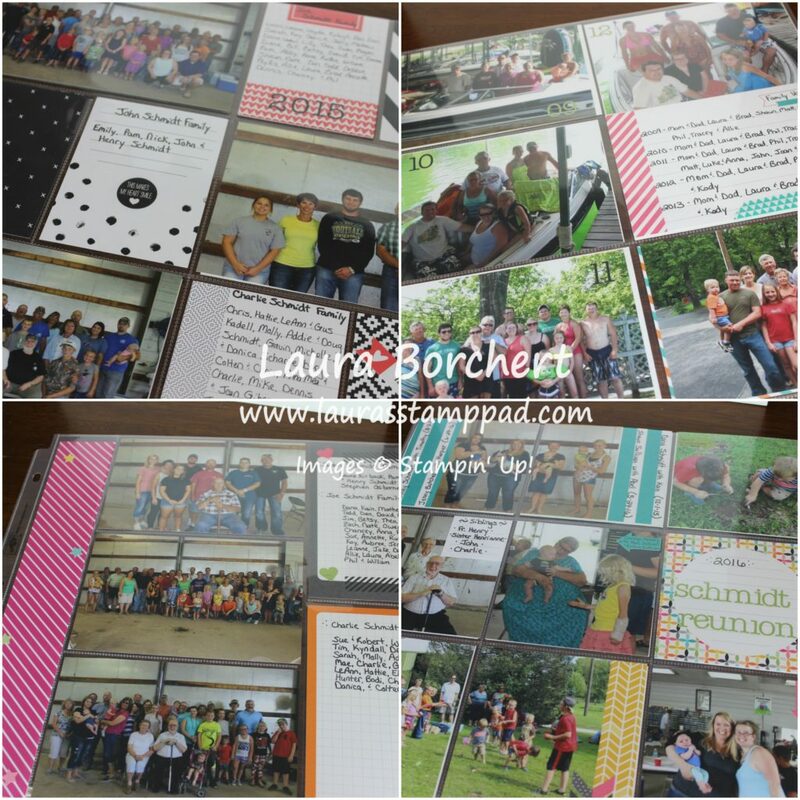 For anyone who has never scrapbooked before, this is totally for you because it is simple and yet exactly what you want – organized photos with information to remember through the years!!! 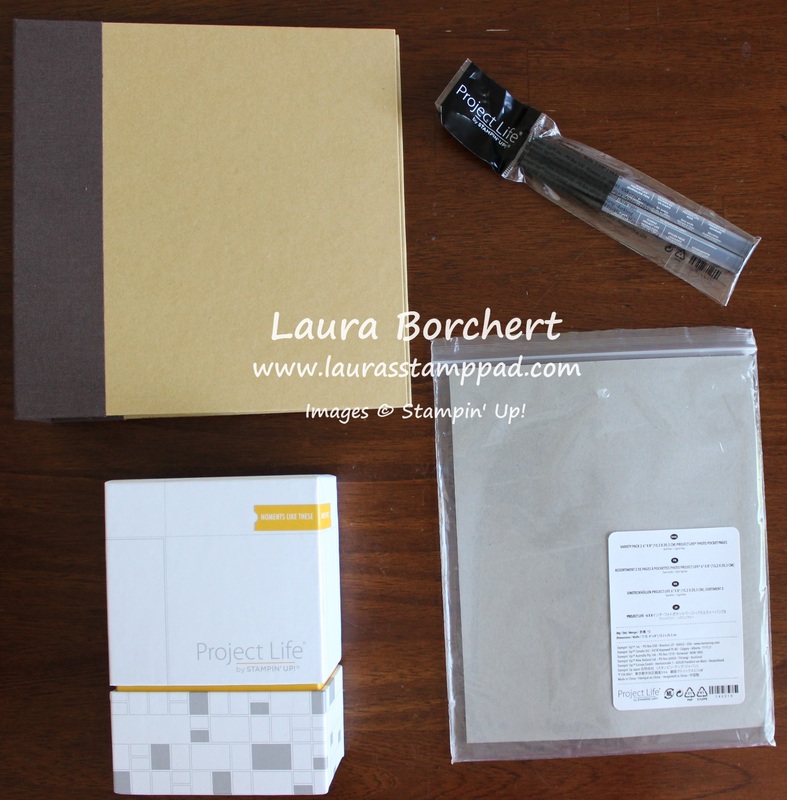 To get started all you need are your photos, an album, pages, a Card Collection Kit, and Journaling Pens. It is that simple! I’m serious!!! Of course you can always add more embellishments and do more to the pages but I think they look great when they are simple! My style of memory keeping is lots of photos and some journaling with very little foo foo. Everyone has their style! 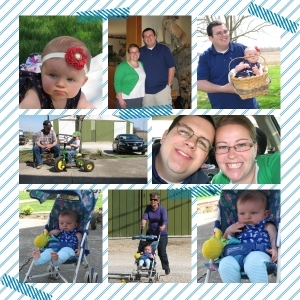 Here is a page that I did for my Family Album! This album has about 2-4 pages each year from the Family Reunion. I love how I didn’t have to cut the pictures at all; I just slid them right in! Also, I loved the 4 pockets for me to journal on. It was perfect. Another bonus I love about Project Life is that many of the cards have a grid or lines on them which make it perfect to write without trailing down or going big to little when you write. Come on, I’m not the only one out there who does that?? 🙂 I used a little washi tape and a few stickers from the Accessory Pack. That little green heart on the far right is covering up a mistake…..come on we all make them and just know how to fix it!!!! Here is another page that I did which was quick and simple. I popped the photos in, a decorative Card Collection and a journaled card collection with a little washi tape!!! Love it!! 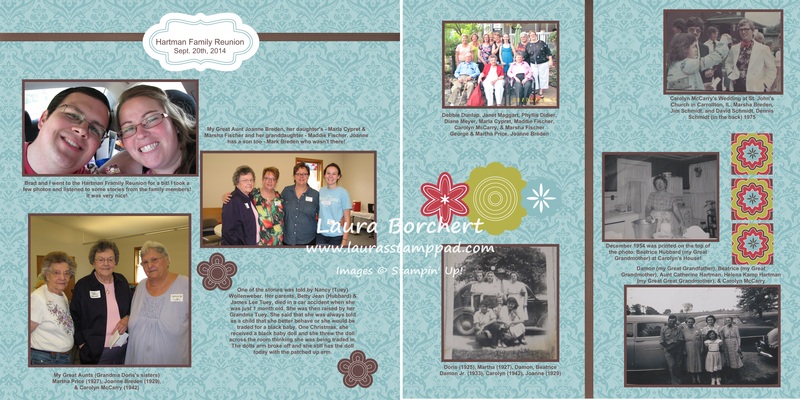 I have done “traditional” scrapbooking in all size. 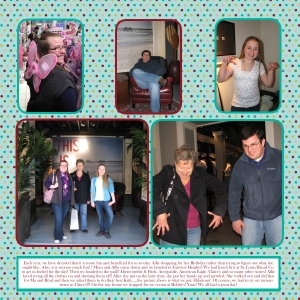 I have done digital scrapbooking and now I have done Project Life. Each one has its pros and cons and it is all based on personal preference! I have done a few classes on Project Life and I have really enjoyed seeing all of the creations!!! 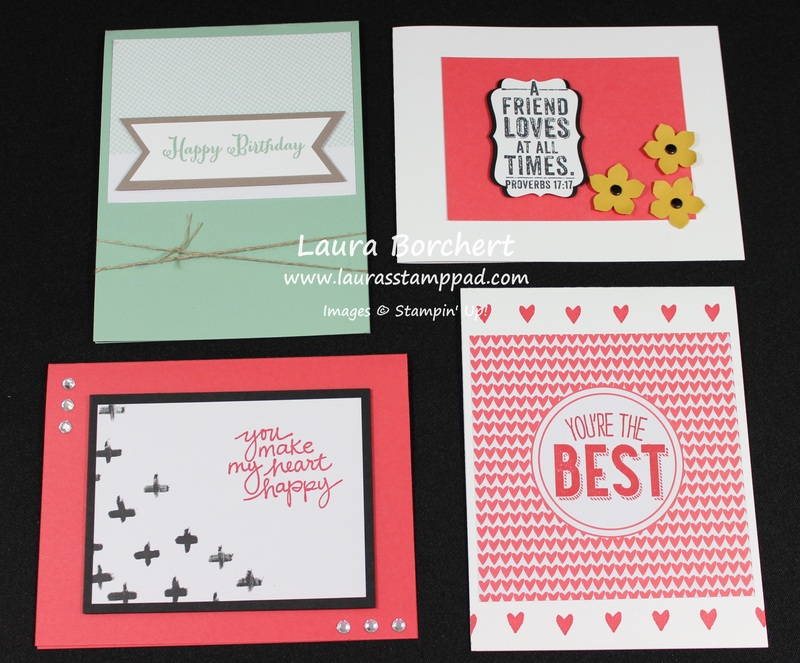 Stay tuned as I will be showing you some OTHER things that you can create with the Project Life Card Collection!! Also, if you would like to see what the Moments Like These Card Collection and Accessory Pack looks like, check out this Video! Have you tried Project Life? What do you think? Leave me a comment down below! I love using the This & That Albums for all of the items I collect throughout the year. Every ticket stub, game score card, receipt and other little fun items cane be found in these little Albums! Of course I have to add in a few pictures here and there as well! This album is fun and all over the place because I just pick a page and put it in there. It doesn’t go in chronological order or have any theme, it’s a little bit of This & That (hehe see how I did that)!!!! My 2013 Album is the one of the bottom right with all the ribbons on the binding. I love that and it’s a great way to use up those little pieces of ribbon you have left over!!! The 2014 Album is on the bottom right. As you can see I have ticket, score cards from playing games with friends and family and a few of my favorites in pictures and in writing!!! 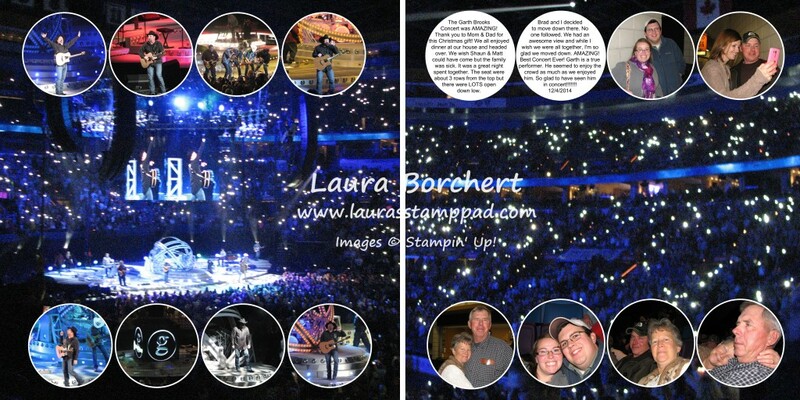 Here is another page with our Garth Brooks tickets and a little writing about the night. Yes, that is a Home Depot receipt from our Christmas Tree! 🙂 I know I’m silly to keep it but I love it!!! This page is fabulous to me!!! Throughout the year, each month Brad and I wrote on little punched pieces of cardstock what made us happy that month and we kept them in a jar. On New Year’s Eve, we read through the items and really enjoyed seeing all of the amazing things in our lives. 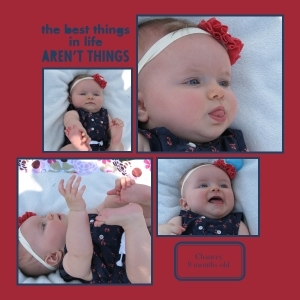 I then put all of those in my This & That Album! There is a lot of talk about nice weather and yummy foods and time spent with each other in there!!! Just a wonderful page that makes me smile! My nieces and nephews always can make me smile so this page is all about them and how much I love them! I love having my picture taken but it doesn’t happy often because I’m usually behind the camera! Here are some pictures of me throughout the year! I love seeing how I changed and how I cut my hair to donate it and how amazing life is!!!! Have you ever used one of the This & That Albums? 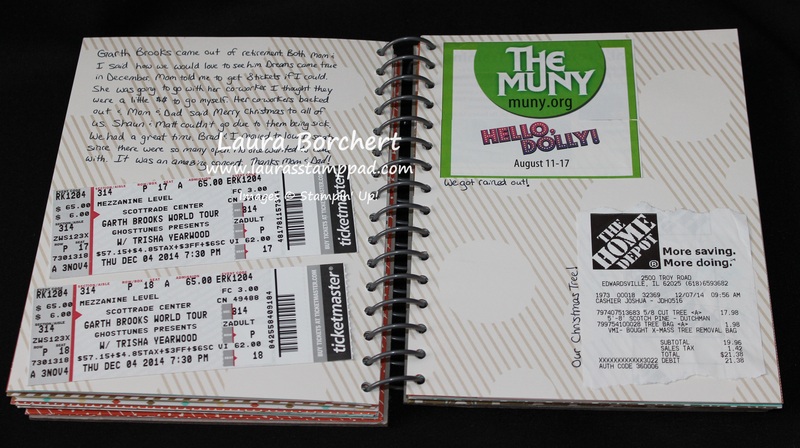 Do you have tickets and items that you would like to put in a book to remember the moment? You can check out all of the goodies here! It is super simple and lots of fun! Let me know in the comment below how you use your This & That Album or how you plan to use it! My Digital Studio – 2014 Album is Done!!! I’m so excited to say this! I love when I complete another year in my scrapbook because then I know that those memories are documented. Of course, I’m sure I missed some things here and there but I know that looking through the album so many amazing memories coming flooding back. That is what I love about it! Plus I’m an organizational freak so I like knowing it is all in one place, put together and complete! I did my 2014 Album in My Digital Studio just like last year! You can see some more samples here, here and here! Many of my pages are fairly simple with a solid or patterned background paper, lots of pictures which are sometimes layered on a color and sometimes not, some journaling and maybe a few other images. I am all about the pictures (all about the pictures…..anyone else singing that song?) and that is what is most important to me. While I enjoy seeing a page with one large picture and lots of embellishments, that isn’t my style. I can take 200 pictures in one hour of an event and I find it hard enough already to narrow it down to 20 or less for my pages. I love My Digital Studio (MDS) for the journaling. I’m still not a huge fan but I say (type) SO much more in these albums then I ever did in my other albums. I would run out of space or misspell something and get frustrated and I don’t like my hand-writing. With MDS, I have spell check, different fonts, I can backspace and delete and it is so much easier! Documenting my family history has become very important to me as all of my grandparents are now angels watching over me rather than here telling me stories and giving me hugs! I have a big family and I find it really interesting to see how we are all connected because many times my parents will say, “oh they are related to you” and I never understand the connection. With photos and timelines and stories, I have made some of those connections and I love it! Family is so important to me and I love these pages now and I’m sure I will even more with every year that passes. I added some ribbon and some of the embellishments to these pages! I have to document Date Night! After all, they say date nights don’t happen very often after children. No we aren’t pregnant yet but we hope to have children in the future! 🙂 I love the Baroque Motifs Stamp Set which is now retired but still available as a Digital Download! Woot Woot! I love how I POPPED my two favorite photos by backing them differently! The most amazing night – Garth Brooks Concert with my family! My parents took us to the Garth Brooks Concert for Christmas this year. It was an amazing concert. It was fun to go with my family. The songs and moment were breathtaking. I used two photos that I took as the background for my pages. I LOVE IT! If you have been to a concert and seen everyone with their phones (or lighters), you know how amazing it looks and here I was able to show that off in my album! Are you working on documenting your memories?? A Wedding, A Baby, A Vacation, Every Year? What is the hardest part for you – picking a layout, journaling (like me), or just finding the time? Leave me a comment down below! 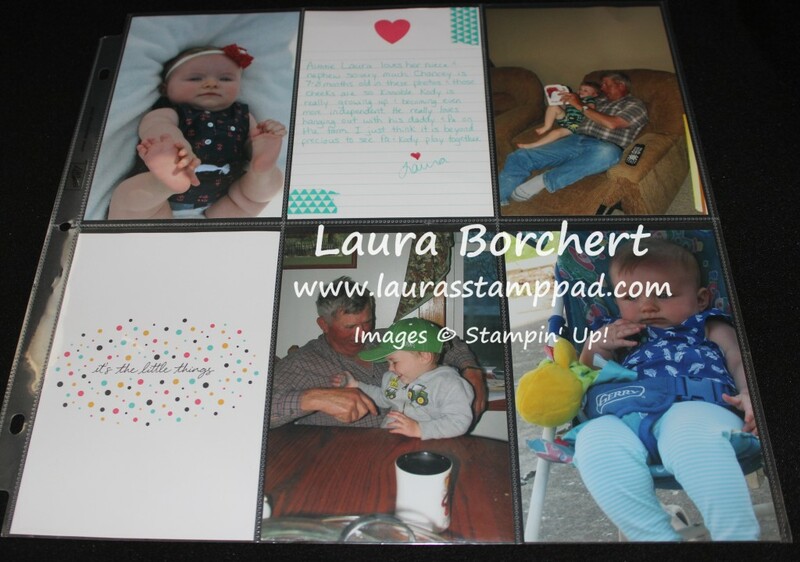 Would you like to organize your photos and document those memories but don’t have the time, energy, or creativity? 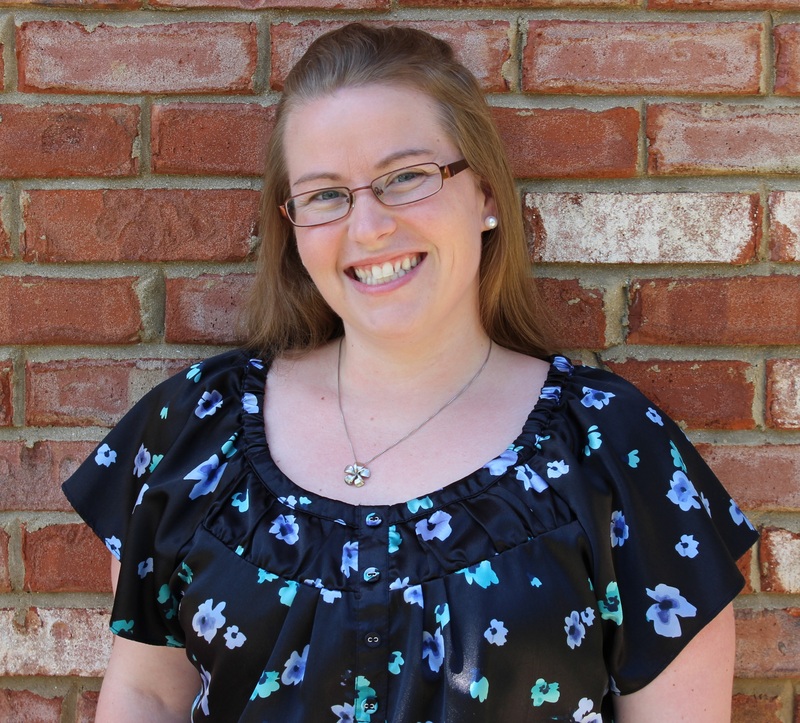 I have the perfect solution for you – Project Life! It is super simple because all you have to do is drop the photo in, drop in a decorative card and maybe write a few words! 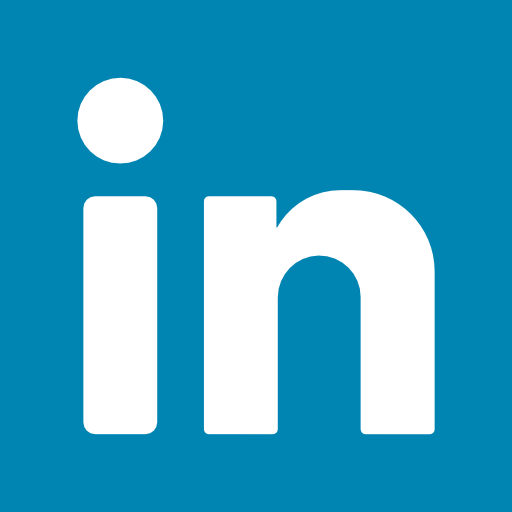 Interested in learning more, leave me a comment down below! I’m working on adding an event to calendar and I want to make sure to invite you! Valentine’s Day is right around the corner and it’s time to show how much you love someone! While that shouldn’t be the only time of the year you show your love, it is a very special day! Some may not like the holiday because they think it is too much or maybe you think you don’t have someone to share your love with BUT YOU DO! I love Valentine’s Day because it is my excuse to show EVERYONE how much I love them! If I gave a card like this to my Brother on a July 18th, he would think I have lost it but on Valentine’s Day (he still might roll his eyes) it is perfect! I think you should show your to everyone around you – Family, Friends, and even Strangers! Share your love!!!! 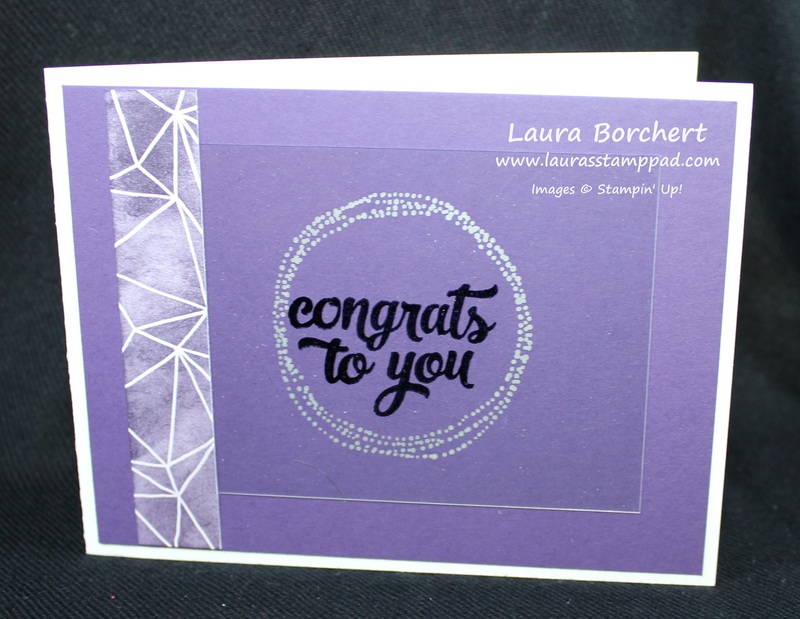 This card was created with some of the new items in the Occasions Mini Catalog! 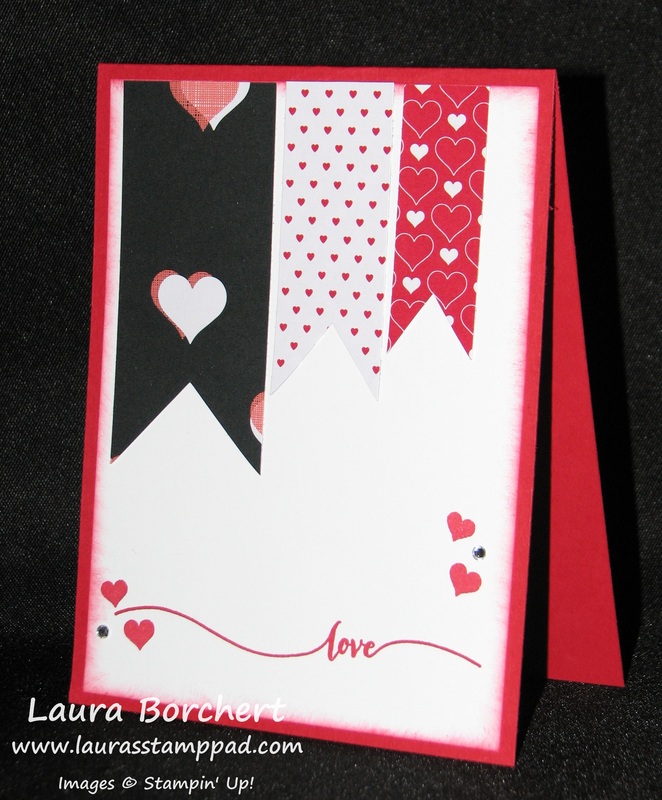 I started with a Real Red card base and then cut out a piece of Whisper White measuring 4″ x 5-1/4″. I brushed the edges with my Real Red Sponge Dauber for a little softness and color! 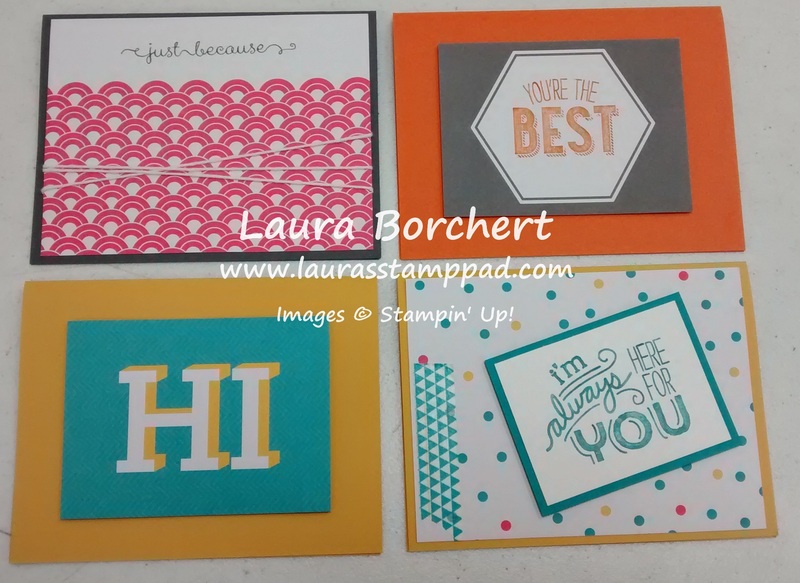 Then I stamped the greeting from the Hello Life Stamp Set! I love this set because it has amazing greetings and I love that long beautiful font. 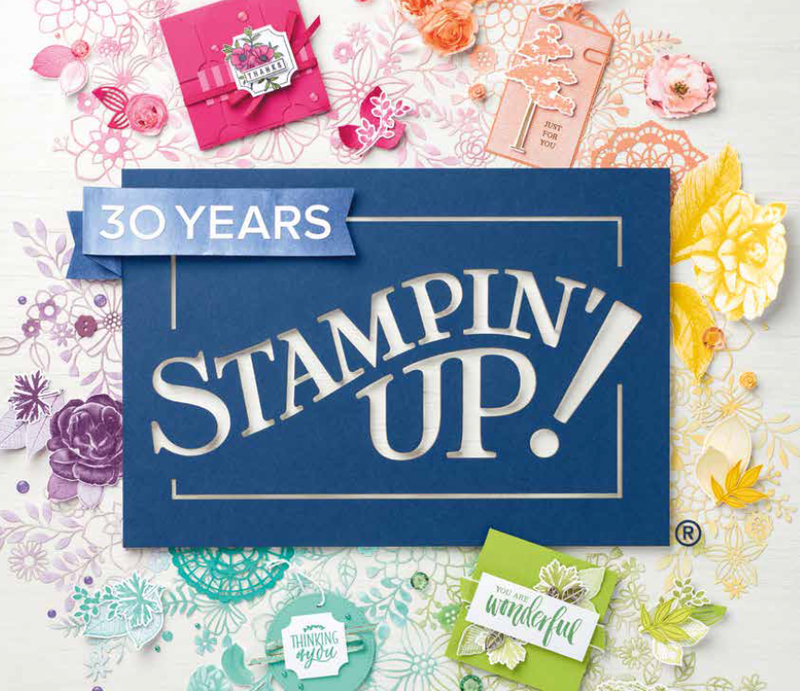 This stamp set is great for Memory Keeping as well because you can stamp that fabulous greeting right onto the bottom of your photo! Adorable! Also, I stamped the little hearts and added in a Rhinestone near both! I love my bling! 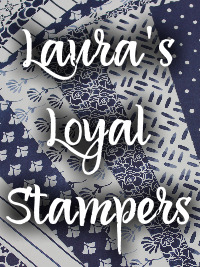 For the banners, I used the NEW Stacked with Love Designer Series Paper! Okay, listen up! This paper is AMAZING! One side is hearts and pinks and corals, and goodies for Valentine’s Day or lovely items BUT the other side is Black and White!!!!! You know how I love my Black and White. I love this because you can purchase this paper and make a few Valentine’s Day cards and use some in your scrapbook for someone you love. Then usually you think what will I do with the rest of this paper pack. You will turn it over is what you will do! 🙂 Oh I love it! (Can you tell?) I cut a few pieces into strips and added the banner tips at the bottom. 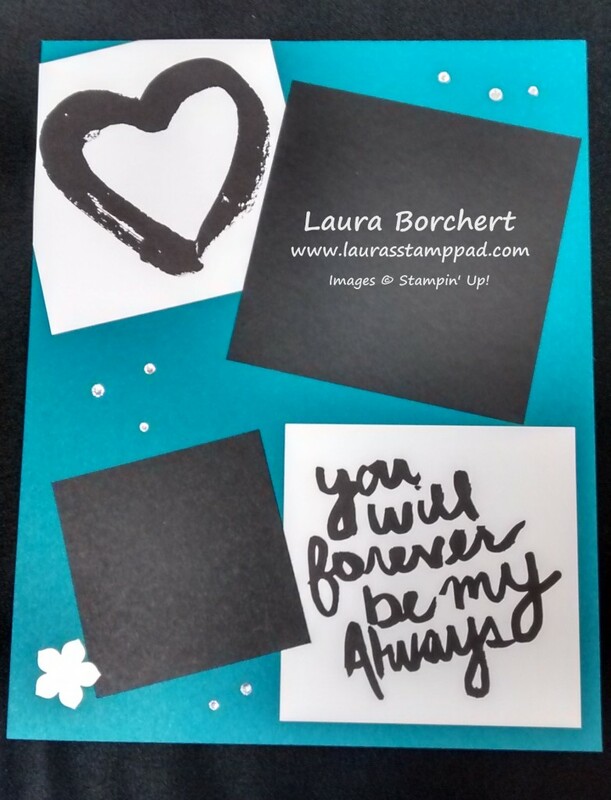 Add those to your Whisper White cardstock and then add this to your card front! All done! Perfect card for someone you love! 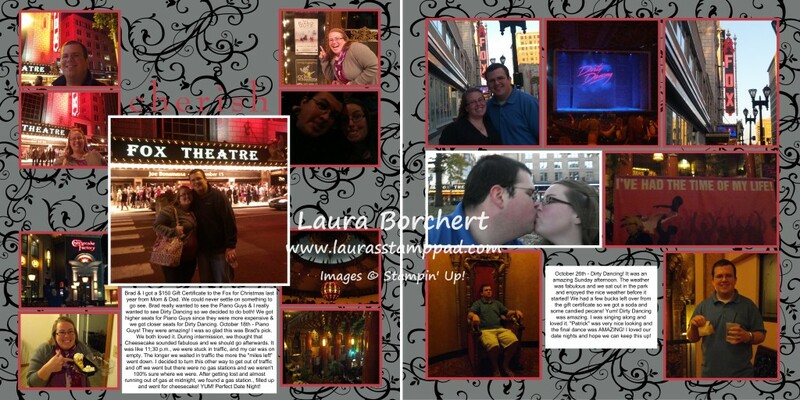 My Digital Studio – 2014 Scrapbook!!! Last year I did my scrapbook digitally with My Digital Studio and I after seeing how easy and fun it was, I have decided to do my 2014 Album the same! You can check out my 2013 Album here and here! I love love love the Olympics! 631 more days till the 2016 Summer Olympics!!!!! I enjoy all of the sports, the energy, excitement and fun of the entire event! There have been many time I have been brought to tears seeing how proud the Olympians are, how far they have come, hearing the National Anthem! I just love it all! I take notes and enjoy the “phrases” that they use! 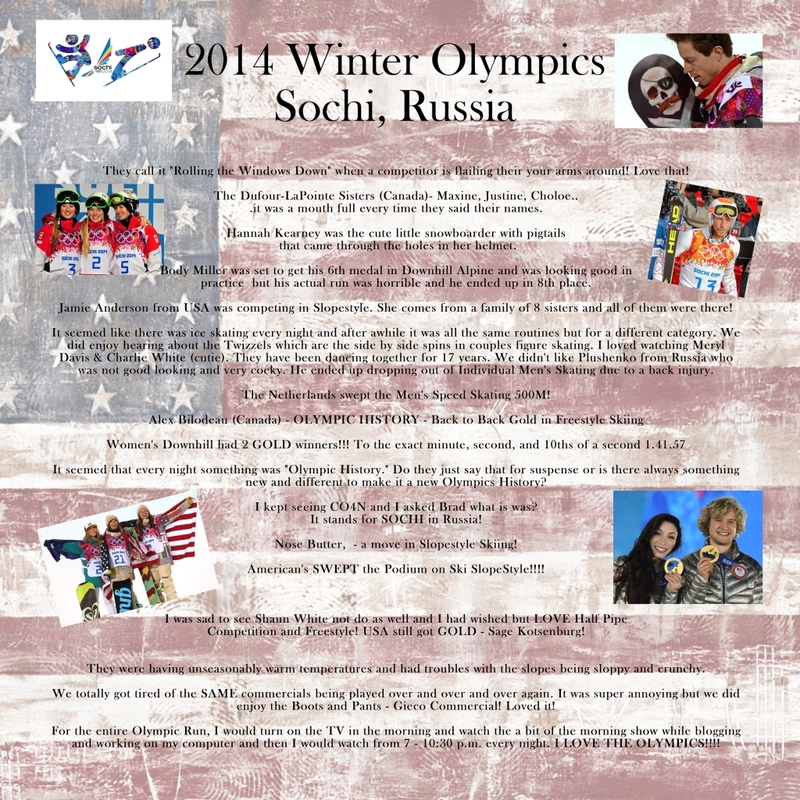 This year for the 2014 Winter Olympics I took notes of these funnies and amazing moments to document in my scrapbook! I really love how this page turned out and to remember those amazing weeks! These pages document our annual shopping trip for my niece’s birthday! We always have a great time and laugh till our bellies hurt! I always enjoy capturing the fun of the day and my niece growing up! As you can see my pages are fairly simple with some patterned paper as the background! 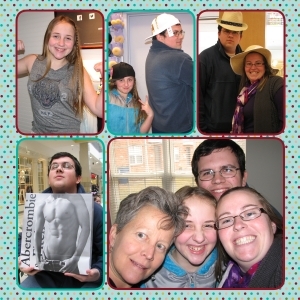 I layered all of the pictures on coordinating colored cardstock and I rounded the corners for a soft look! Also, I journal A LOT more with my digital album because typing is so much easier and if I mess up, I can just hit backspace rather than find a sticker or punched flower (etc) to cover it up! 🙂 Come on….you have all done that, right? Is she not the most precious little girl ever? For this page, I actually grabbed the color of her hair bow and dress to use as the colors for the background and photo layering. That is a super fabulous feature in My Digital Studio when none of the other patterns or solids seem to work! Simple yet focuses on that adorable face which is the most important thing for me! I prefer simple pages with lots and lots of photos! That is just my scrapbooking style! 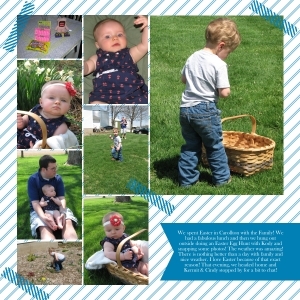 If you prefer one focal photo with some embellishments in the corner or along the bottom, you can do that too! There are so many different options with My Digital Studio! Check out these…. 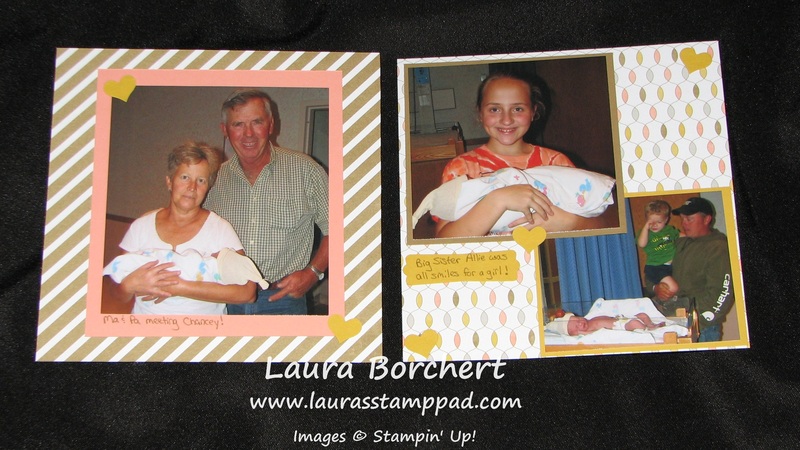 For these pages, I added some “washi tape” to the corners of the photos which adds a fabulous look! I love the simple and playful look it gives. Again you can see I love putting lots of photos on my pages! 🙂 My Digital Studio comes with LOTS of photo layouts that include any where from 1 to 15 photos on a page. You can always download more like these or this baby album here! 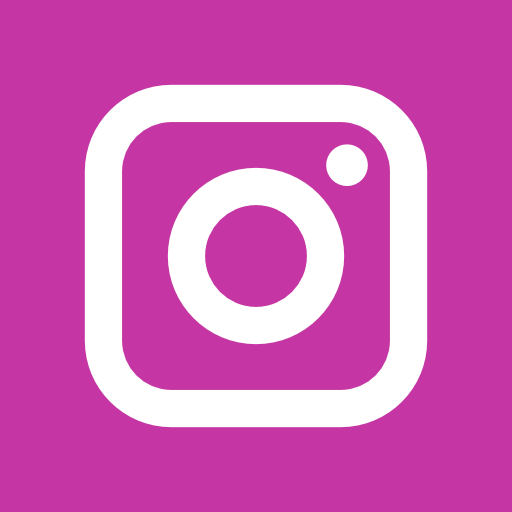 Don’t worry if you don’t like all of the pages or layouts, you can always create your own or delete out 1 photo from a page or even add a photo! There is so much flexibility to My Digital Studio! You can try out My Digital Studio for 30 Days for Free by clicking here and if you want to purchase the software you can here! 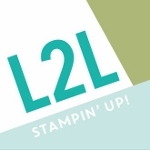 There are new downloads every month so be sure to check those out if you are looking for something specific or a certain type of album that you would like to create! I’ll be sharing more of my 2014 Album soon so be on the lookout! I used the new Lullaby Designer Series Paper which is just precious. I also noticed that you shouldn’t be fooled by the name….there really isn’t anything that says BABY in this paper. If you like yellows, corals, blues, and browns this is the paper for you! Then for the journal tags, I used a few from my Project Life Everyday Adventure Card Collection. This is another wow item! This card collection comes with 100, (that’s right) one hundred double sided cards! Some of these cards are just designs and others have patterns or words already on them but they are fabulous!!! Of course, they are the perfect size to slide into your Project Life Photo Pocket Pages but you can use them on other projects like this one or even cards! For my little decoration, I used the Itty Bitty Punch Pack flower in Crisp Cantaloupe and some pearls! Love it! Here is the second page (double page spread). Again I used the Lullaby Paper for my backgrounds! I added in the heart from the Itty Bitty Punch Pack and added my greeting on a piece of Hello Honey punched out with the Modern Label Punch! 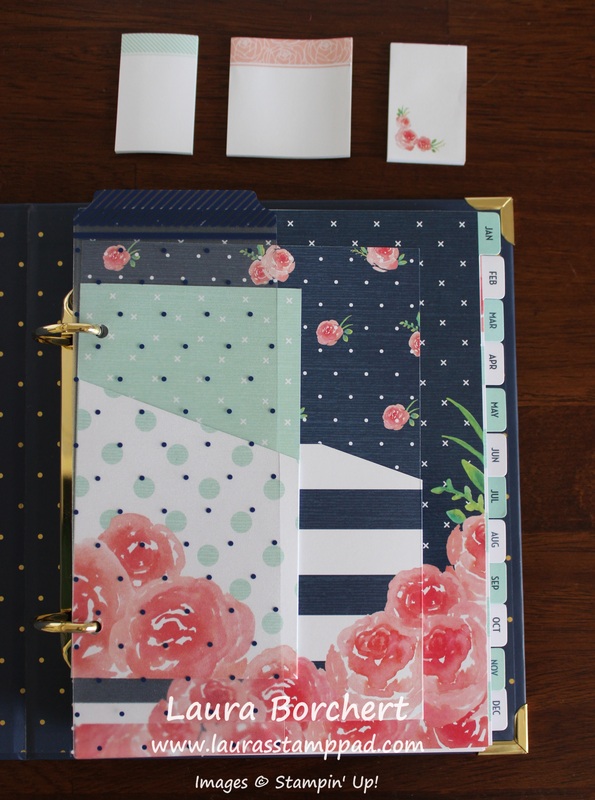 I was able to complete these 4 pages in a matter of minutes with my Designer Series Paper (and the list of coordinating colors in the catalog), some punches, and the Project Life Card Collection! Scrapbooking made easy let me tell you! I hope you give it a try either as a new scrapbooker or a seasoned scrapbooker! Thank you to everyone who wished me well on my Anniversary last week. The WINNER are: Deb P, Vicki M, and Tanishae T!